I keep producing blogs that are highly finished pieces of writing, like essays. Which isn’t to say I labour over them, more that I keep feeling each has to be a thing in itself. But that’s not what blogs are for. So this one is just a few thoughts about how I came to write Mortal Fire and why some of the things in it are in it. And if it does happen to organise itself in composition then yay. To coincide with Mortal Fire’s publication in the US I’ve been writing a few guest blogs. They’ll appear over the next few weeks, and I’ll post links. Those guest blogs talk about stuff I won’t cover here. So that you know it is covered – or at least addressed – I’ll give you the subjects. 1) My kind of Heroine 2) Invisible Monsters 3) How using an exotic – to Northern Hemisphere readers – location in a fantasy novel creates ‘two levels of invention’ in the work. And 4) How, when writing, to get out of your own way. Since I’ve promised blogs on those topics I will try not to stray into them here. The keywords websites use when they first begin characterising a book are a pretty good guide to the things those commentators feel readers will find remarkable in that book. It’s all factual stuff of course. So: World War Two, mining disasters, beekeeping, South Pacific, polio… As opposed to: identity, loyalty, crime and punishment, family, heritage, theft… I think I’ll do what the keyword formulas do and ignore the abstract nouns, and tell how some of the other stuff comes to be in the book. Beekeeping. I wanted to set my story in a pastoral paradise. 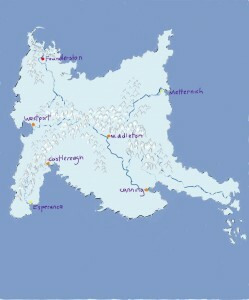 The Zarene Valley is kind of based on valleys now beneath Lake Dunstan. Those now-drowned valleys circa 1981, when I was down there with my sister and some friends (touring about in a 1957 Plymouth station wagon). Back then there were no vineyards, and more kiwi holidaymakers than tourists. 1981 is pretty much equidistant from 1959 and 2013, but it was more like 1959. Also I felt that I was in some ways writing the book for my editor, Frances Foster. I was thinking of her as a first reader. And I remembered how, when I met Frances at the Disney Convention Centre in 2008, when I was there for the American Library Association Conference, she told me about being a child visiting her grandparents’ farm in Anaheim, back before Disneyland bought up all the land. I remember her description of the pastoral paradise now under the theme park and hotels and highways. So – old Anaheim, and the apricot orchards under Lake Dunstan, are what made the Zarene Valley. A Mining Disaster. The disaster was in Mortal Fire before Pike River. I considered taking it out, but then I thought about all the mining disasters in New Zealand – a whole history of them – and told myself not to be so shallowly presentist, and, besides, the Bull Mine Disaster is historical in the novel (1929). Where the novel’s mining disaster came from is quite interesting. When I was first planning my novel Daylight – a book which gestated between 1997 and 2001 – I had this high-concept idea about a small society of vampires who, in order to “give something back”, had decided to use their strength, resilience and lack of any need for oxygen to become a crack underground rescue team. I talked to a cave rescuer in Motueka, and had an email correspondence with one George Muise, a Mine Rescue Captain from Nova Scotia. I was writing to Mr Muise in 1997 (and only printed out a few emails, the rest were deleted with my account once my time as Writer in Residence at Victoria University came to an end. There were also many emails between me and my US agent about the sale of The Vintner’s Luck. I printed some out. I have these things, and my handwritten ms, but I’m not feeling any archive love…). George Muise was the leader of the first rescue team that went into the Westray Mine after a catastrophic methane gas explosion in 1992. His team went the deepest and recovered a number of bodies. George Muise described it all to me. His namesake in Mortal Fire – George Mews – gives Canny’s brother Sholto a tour of a mine while telling him what Bull Mine was like when he led rescuers into it thirty years before. That chapter is Mr Muise speaking, and the report of the Government enquiry into the Westray disaster, a report which I ordered, in its four volumes, from Nova Scotia, in 1998. I’d read that report – so I wasn’t really in the dark about Pike River when it happened. I wish the right people – those who weren’t mere novelists – had had the Westray report sitting in their bookshelves. Canny’s pacific heritage. Though the fact Canny is a Pacific Islander first rose out of my wanting her to have a mother who was a civilian hero – a mother who was a teenager when she did her brave things – there were other reasons for Canny’s Pasifika heritage. Reasons mixed up in complex ways with some very personal matters. And not just personal to me. More personal to other family members. But I’ll give this a go. My sister-in-law is Tongan, and my nephews and niece south Auckland Pasifika kids. I’m very fond of the them, and, I hope, have been slightly useful to them since their father, my husbands’ brother, died. What isn’t complicated is my affection for them, and my curiosity about them and their lives (very different than my life). The kids are great conversationalists when they get going, especially the two older boys, and I’m sure Auntie and Uncle exasperate them with questions about how school is and whether they’re playing rugby (their Dad used to coach kids’ teams at Manukau Rovers), but sometimes we hit on stuff we have in common, like the fascinating behaviour of certain family members, and – more me than Fergus – TV, films, books. I’m all over that stuff like a happy dog. Anyway – there’s so much not to take for granted about the relationship that I spend quite a bit of time thinking about them. About what kind of people they are and how they’re coming along. Their father, Duncan, was killed, and the man who killed him went to prison for manslaughter. Duncan died in Rarotonga (where he was with his team on a Golden Oldies rugby tour). The trial was over a year later. That’s my only visit – so far – to a Pacific Island. I thought a lot about that visit and that time. I loved Rarotonga and the people we met, the strangers who talked to us about what had happened. Being at the trial was difficult and sad, but also very vivid and somehow a satisfying experience. It was – the whole thing was – proof of a something about life, and people, that I think most of us know but don’t always feel, and that is: for all that there are careless people capable of callously destructive acts, most people make things, and mend things, and are quiet supporters of the world’s greatest and most ordinary cause – the long cause of care. All of that went into Mortal Fire, a knot of loyalties and pity and sympathy and realisations and enchantment. Also, I had a thought I’d never really had before. And it became Mortal Fire‘s secondary theme. (The primary theme is how you can’t always save people, or spare them. The two books I wrote between 2009 and 2012 have that, mostly because of my mother and her Motor Neurone Disease – which among other things is an exercise in being able to do less and less to help all the time. But because of Duncan too, and my husband’s family, especially the kids. Because of many nights lying awake, thinking in desperation and worry, ‘What can I do? What can I do?’) Anyway – this was the secondary theme-inspiring thought I had, and when I had it. It was about our desire to punish people who harm us, and what that desire does to us. We were in Rarotonga, attending the trial, and all hoping for a guilty verdict. The idea that the guy who did it might get off was awful. (It wasn’t very likely – but with awful possibilities the odds always seem shorter than they are.) In the hours and days when the court wasn’t in session we looked around the island. Once when we were driving on the inland ring road we passed a sign pointing to the Cook Island prison and went to take a look. We sat in the car for a short time looking across a humpy green field at the long, low building. It had barred windows, each with a single horizontally-hinged shutter. The shutters were propped open. The sunshine was bright and hot and the prison’s interior was just a blackness. Now, I might have wanted the guy to go to prison, but right then the thought of putting any fellow human being in that place and making them stay was quite hard. Or serious. Or just real – it made my desire for this man’s punishment something I had not just to feel, but to be responsible for. So, the trial ended and I came home and I went on thinking about that moment, and my own piteous human hesitation, a piteous human hesitation which the man who drove his truck into Duncan failed to have. Anyway – it wasn’t that I stopped feeling angry and vengeful, or even thought I should, only that I came to understand that my human hesitation was a far, far more valuable feeling (I mean not just to me – but in life, in the world). And some of this found its way into Mortal Fire. That’s it. That’s why my this and that is in the novel. I don’t think writers look around for things to put into books, like everyday cooks staring at the shelves of their pantry. I’ve always loved this quote from Emily Dickinson: “Nature is a haunted house – but Art – is a house that tries to be haunted.” Dickinson gets the sense of there being something wrongheaded in what art wants for itself. I mean, who wants to live in a haunted house? But I know this: though I don’t hold a seance and invite the ghosts, I do let them in when they appear at my doors and windows. Dear Elizabeth Knox, this is my new favourite not-a-blog (and you’re one of my favourite writers!). I feel sad that the only comments here are trackback and spam – but I am really looking forward to reading Mortal Fire, and super excited that it is set in the Dreamhunter universe. Also, I bought Billie’s Kiss in the middle of last year in a cute 2nd-hand bookshop in North-East Valley (having already read it). It keeps ending up next to my bed, where I re-read little bits of it obsessively. I read very quickly but sometimes miss things – so although I have read some sections about 20 times, I still occasionally notice something new. Thanks for your comment. I’m so pleased you’ve got Billie’s Kiss. My only mystery/crime novel. I hope you like Mortal Fire. I’m blogging again this week. I’m not nearly as regular as I should be — but then I write these essays. I did so many guest blogs for the MF launch that I was all blogged out. The links are on the MF page (which also needs updating).